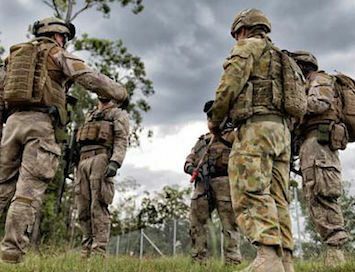 Australian troops deploy to Iraq (image via army.gov.au). Pressure over the Chilcot Report is mounting for Tony Blair but with the ICC's powers increasing, storm clouds may also be gathering over Bush and Howard, says Dr Alison Broinowski. AS OFTEN happens after major events, new alarums and excursions soon distract people’s attention to something else. Before most people in England have even been able to read the whole of the Chilcot Report, they are beset with leadership turmoil in several political parties, obsessed with the fallout from Brexit and concerned about more gun violence in the United States. Those distractions allow a pause for some reflection on what Chilcot calls the lessons to be learned and the implications of his findings for Britain’s future and Australia’s. In the Guardian (10 July) Andrew Rawnsley, an authority on Tony Blair’s prime ministership, reports soothing noises coming out of Whitehall about Chilcot’s lessons having already being learned and changes put in place. Although Blair should have asked for more checks of the dubious intelligence, the blame for "misleading" him is conveniently being shifted to the two successive heads of M16 at the time. The separation between those gathering intelligence and those assessing it is claimed already to have been reinforced. New firewalls are said to have been placed between the spies and the politicians. Cold comfort though, if ministers currently making decisions about Iraq and Syria are not to be told what the spies know is happening and likely to happen there. More contentious – and likely to endure for some time – is the current discussion about the legality of Blair’s actions. Chilcot finds that the legal basis for the invasion of Iraq was ‘far from satisfactory’. He also indicates the Cabinet failed to question Lord Goldsmith’s belated change of mind when he returned from a trip to the U.S. and reversed his earlier opinion that the invasion would be illegal. Chilcot records that Blair unsuccessfully sought a second resolution from the UN Security Council for the invasion. But because Chilcot is not a judge, he is unable to comment on the legality of the war — a limitation of which those who helped Prime Minister Gordon Brown set up the terms of reference in 2009 were no doubt aware. So for blame to attach to those who deserve it, further procedures will be needed. The International Criminal Court (ICC) can prosecute individuals for war crimes but the UK would presumably want its own judicial processes to be exhausted first. Blair could be prosecuted for "Misconduct in Public Office", a provision dating from the19th Century. Or, Parliament can apply the procedure of "impeachment", which has not been done since 1806. The patience of bereaved families of service people has been tested long enough and many who want to see Blair in court will not welcome further delays. Meanwhile, Bush and Howard continue to get off lightly. But the prospect of the crime of aggression being added to the jurisdiction of the ICC next year, must have leaders in many countries rethinking the way they go to future wars. Dr Alison Broinowski is vice-president of Australians for War Powers Reform and vice-president of Honest History. Howard is not looking any better on Lateline. Fudge, bluster, wriggle, squirm. Disgraceful. Pathetic. Be informed. Subscribe to IA for just $5. If Australia has switched enemies in Syria, who and why are we fighting?